JUMLA, July 9: Few years ago, Gothichaur Rural Municipality got its first health post. Khadka Bahadur Budha one of the residents here has never been to this health post situated in Maningsanghu despite having numerous health problems. Whenever he or any other member of his family has any health problems, they reach out to the shaman. The faith that he has on shaman is hardly there for medics in the hospital. “Our diseases are rarely healed by medicines provided by the doctors but the Shamans cure them immediately,” Budha replied when asked why he does not visits hospitals to seek medical treatment. According to him, locals keep complaining about the absence of health workers and doctors in heath posts. So, instead of waiting for hours, villagers prefer going to nearby shamans or witch doctors and get immediate treatment. Budha is not the only one the area who has unflinching faith on the shamans. In this area, shamans are the first responders for all the villagers. Going to hospitals or health post is a second option for them. Locals go to hospitals only after shamans fail to treat the patient and order them to visit hospitals. No matter how much they are in pain, they don’t seek medical treatment unless the shamans tell them to do so. “Sometimes, shamans can’t cure some of the diseases and refer the patients to health posts. That’s only when we go to hospitals,” said Budha. Like most of the rural areas of the district, people here believe that that god created diseases and makes some people ill to punish them for their misdeeds. Because of such a belief, people find it more convenient to cure those diseases by pleasing god via the shamans instead of seeking medical treatment from doctors. Apart from that, government’s failure to provide timely and reliable treatment is another reason why villagers don’t rely on seeking medical treatments. At first, there are only few health organizations in Jumla. Most of these lack proper equipment and medicines. Sometimes people reach to these organizations seeking treatment by travelling a long distance. But, when they reach there, they don’t get the treatment in lack of health worker, medicines or equipments. Locals here have repeatedly complained that the health institutions in the district do not provide appropriate treatment. “The medicines we are provided in the health posts are rarely effective in curing diseases. Expecting to get good medicines and timely treatment in our village is a mistake,” said Singh Bohora of Patarasi Rural Municipality. This has reinforced people’s dependence on the shamans. However, in the recent years shamans have been recommending people to visit medical centers for treatment. Health professionals laud such acts. In the past shamans taught people, that god punishes humans with diseases for their misdeeds and that they can be cured by pleasing the gods via them. However, in the recent years, they are trying to undo their own teachings by sending patients to hospitals and health professionals say that it will take time to change people’s perception. 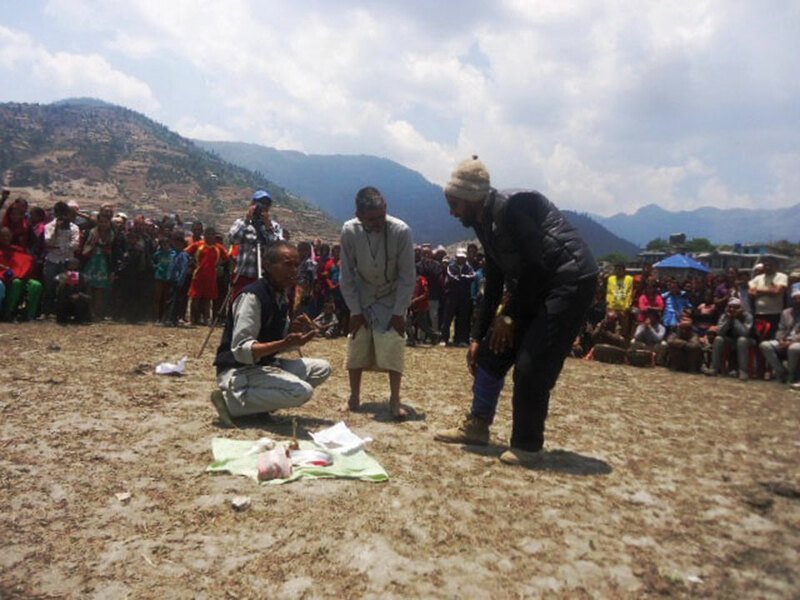 Aman Budha, a shaman of Tila Rural Municipality-9, informed that lack of faith in medical treatment is the reason why people still prefer shamans. “We hear a lot of cases of people losing their lives by relying on shamans and witch doctors,” said Aman, adding, “We don’t want people to lose their lives because of us. So, we have been referring them to hospitals if we can’t treat them.” Despite persuading a lot, he laments that people still refuse to go to hospitals. According to the health workers of District Health Office, Jumla, more and more people have been visiting health centers for checkups and treatments in the recent days and they credit shamans for this surge. While villagers keep complaining that local health organizations do not provide efficient health service, health workers of DHO claim that they have been doing everything possible to provide quality treatment to patients. However, they admit that they do not have sufficient medicines and manpower. There are altogether, 29 health posts, a primary health center, one urban health clinic and 10 community health units in the district. 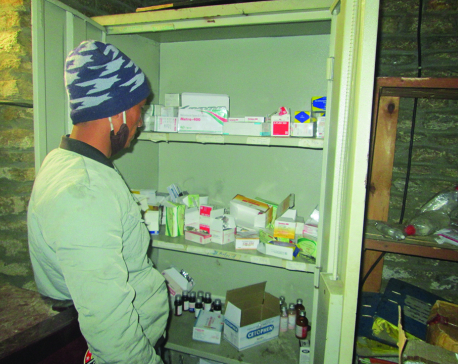 However, posts of five female health workers, five health assistants, two assistant health officers, one lab assistant and one public health nurse are still vacant in the district, informed Angad Bahadur Shahi, chief of District Health Office, Jumla.